(Nanowerk News) New work from the Institute of Food Research has shown how sugar beet pectin acts as an efficient emulsifier, using a technique that could be used to unravel in the finest detail how such important food ingredients work. Emulsions are stabilised dispersions of oil droplets in water and are found everywhere, in pharmaceuticals, cosmetics and in a wide range of foods. Emulsions can be stabilised and prevented from separating by emulsifiers: molecules that accumulate at and stabilise the surface of the droplets. 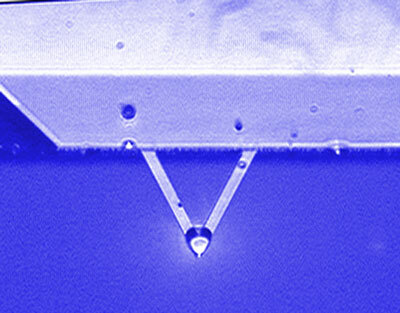 An oil droplet attached to the end of an AFM cantilever. Around 1500 of these droplets would fit on the head of a pin. Pectin is a familiar but complex polysaccharide that forms an integral part of plant cell walls. For commercial use pectin is usually derived from waste material in citrus processing and cider making, but pectin extracted from sugar beet pulp is attracting more and more interest because it has unusual emulsifying properties. Supported by the Biotechnology and Biological Sciences Research Council (BBSRC), Dr Axel Gromer working with Dr Rob Penfold, and Professor Vic Morris and his group at the Institute of Food Research, an Institute of the BBSRC, have probed the molecular basis of sugar beet pectin's emulsifying properties. At the same time they have been uncovering new ways to learn more about how emulsions themselves work. They have used atomic force microscopy (AFM) to image the structures formed by sugar beet pectin at oil droplet surfaces and, for the first time, to measure directly the effects of these surface structures on the forces between two oil drops in water. The studies, published in the journal Soft Matter ("Molecular basis for the emulsifying properties of sugar beet pectin studied by atomic force microscopy and force spectroscopy"), have revealed new insights into the way droplets in emulsions interact with each other. These techniques allow us to understand how droplets behave when they collide: do they fuse, aggregate or bounce apart, and why? Such understanding underpins the ability to design emulsions with improved quality and to engineer such structures to produce new functional foods with improved nutritional and health benefits.